When Time Challenger arrived on the market, it was the first product to heavily include Resveratrol to gather the benefits of lower blood pressure, lower cholesterol, and all the benefits of the anti-aging properties of deep red wine known to the Mediterranean diets. The product would later contain more of this ingredient than in any other product available today. As the product began to reach the general public, various conditions were reported as having improved very quickly. Most notably, reduction of high blood pressure. At this point, please understand, the company makes no such claims. The active system driving this reduction in pressure was rejuvenated (well fed) mitochondria living in the blood delivery system of the human body; cells in the veins and arteries. “Well, I was having a sandwich on the porch and the mailman came to my box at the street. I went to the porch steps and walked down one step at a time since I have a bad knee. I walked to the mailbox. As I turned around my old dog George walked up the steps and headed to my lunch. I hurried up the sidewalk and got to the top of the porch in time to shoo him away. I suddenly realized I had bounded up the steps without so much as a hint of pain in my knee! This was the first time in 15 months such a thing had happened. I walked over to the stairs and was able to walk down and back up without pain. So, I am calling you to ask how I can sell this stuff since I sell stuff I believe in!” She became a distributor and her pain has never returned! We have had dog owners with amazing stories of dogs recovering from age related maladies only to start acting like young dogs again. Again, totally the result of renewed and well fed mitochondria. One dog even began to see much better which does not in the least surprise me. It has been the results of tasking Time Challengerover the last 12 years that my own vision has improved so that twice when I needed glasses the prescriptions were less than before. In the area of Diabetes, Time Challenger entered the field of herbology with a blend of Time Challenger Original Formula and unique herbs and spices known to improve control of blood sugar. Reports have come in claiming success in blood sugar control over not taking the product Diabetic Response. Again, the company makes no such claims only reporting what customers have reported. In the area of Immune boosting, the Time Challenger product ZAP! enhances the human immune system by providing a condensed blend of herbs and spices known to benefit this essential part of our human bodies. When taken early in the morning, ZAP! has been reported to boost energy and reduce “morning lag time”, helping to get a person going without dosing up with caffeine. Some even take the product in the evening during flu season as they feel it helps provide an immunity booster as they work with the general public all day. 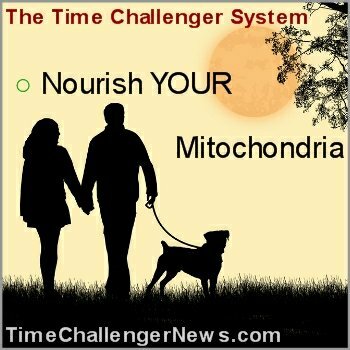 When one considers all the benefits of improving the health of your mitochondria, one has to wonder why everyone is not feeding theirs. Research is now showing that the primary cause of the effects we call aging is merely the death or mutation of a person’s mitochondria. Since it is now possible to improve this situation and do it at a cost that makes it possible for anyone, why allow your body to needlessly deteriorate. Go to www.timechallengerlabs.comand read about the major advances in this exciting field. Some young people start with only one capsule a day, others in later years are utilizing the serving sizes presented on the product.